The VOPEX® Touch Screen Sharer allows 2 or 4 touch screen monitors to communicate with a single PC. 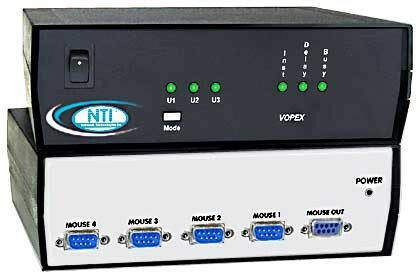 Also known as: VGA video splitter, KVM splitter for touch screen, access one computer from multiple locations touch screen sharer, touch screen monitor, hub, touch screen KVM splitter, numerous touch screen to one PC. The VOPEX Touch Screen Sharer enables up to 2 or 4 touch screen monitors to communicate with 1 CPU. Three different operating modes allow varying degrees of user control. LED's on the front panel will illuminate to indicate mode of operation, DELAY mode program status, and/or which touch screen has control. For use with NTI's VGA Splitter. Three modes of user control operation. Allow numerous touch screen monitors to communicate with 1 computer. 2-4 Male 9 pin D serial connectors to the touch screen. 1 Female 9 pin D serial connector to the HOST computer. USERx mode, only one user has control over the computer, until the user setting is manually changed. INST mode, all users of touch screens connected to the switch have simultaneous control over the computer. Each user has equal control, no users are locked out. DELAY mode, the first touch screen to be made active by a user gets control while other touch screens are locked out until activity stops for a programmable delay time period. LED's on the front panel will illuminate to indicate mode of operation, DELAY mode program status, and/or which touch screen has control. A red BUSY LED located on the front of the Vopex indicates when one of the screens is in use while in DELAY and INST modes. "The help and support that I recently received on my VOPEX Touch Screen Sharer was fantastic. The level of service from Andy Lorenz who originally collected my information and finally processed my order was exceptional. Steve Hlava who tracked down and solved my problem, is most impressive. His call back was prompt and he left detailed messages. I hope that both he and Andy are properly recognized for their high level of support."